While I make an attempt to be as all-encompassing as possible in my work here I admit that there are oftentimes aspects deliberately overlooked in terms of what gets posted.Today I wanted to discuss a relationship that rarely gets discussed here, and that’s the one that exists between equity markets and interest rates. Some sophisticated investment models monitor this relationship heavily as a general meter of optimism and pessimism when flows find their way in and out of the market. Particularly when Fed activity is expectedly on the rise (cutting or raising) do you see this relationship start to get monitored to a higher degree, and many models take a look at these rates in terms of an indication that lower rates mean future positive flows in terms of the equity market as more projects are able to get accomplished on lower borrowing rates. While I don’t like to provide any general rule of thumb in terms of these two sharing any form of positive or negative correlation, for the most part, they remain positive. When they start to get out of synch with one another do you really get signs of an excited or optimistic market, as was the case in recent weeks. Below is a chart of the S&P 500 and 5 year t-notes, with just a few notable peaks and valleys marked up to help with my explain that follows. First it is important to note that the short term yields are more likely to correspond with better behavior as the longer the term the less prone to short term fluctuation in relation to the stock market. Particularly in downswings, it is visible that the correlation starts to lose track with 5 years leading the index by several days or weeks (they begin to decline, while stocks maintain upward momentum). Subsequently, stocks “catch up” to the t-notes, heading into similar declines. Peaks in yields followed by decline have, in recent times, indicated that equities are likely to follow through. 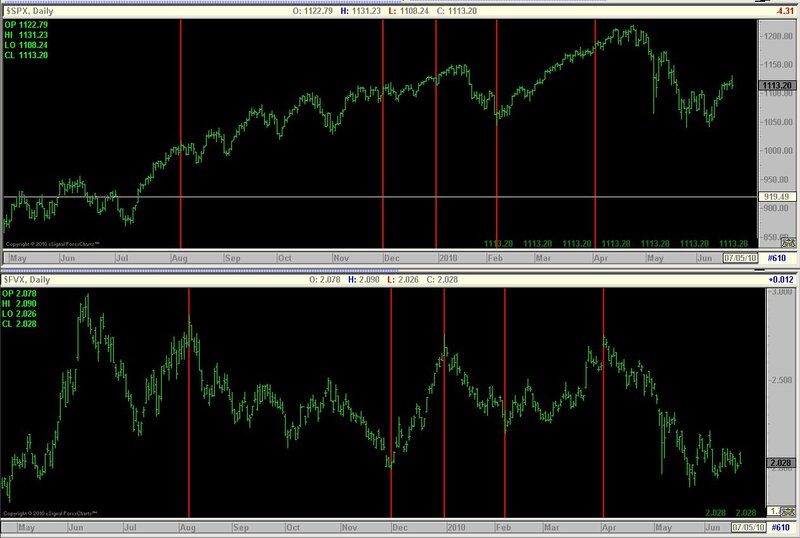 Conversely, bottoms in t-notes have typically corresponded with a seemingly tighter correlation in equities; in other words they have essentially remained tightly wound with one another in terms of bottom days, and would reverse literally on that day or very shortly thereafter. In periods of consolidation or racing bull market weeks you start to see things unravel, as was the case at the end of February and March of this year. Generally speaking (as always is the case when you discuss correlations) market optimism ensues when the correlation unravels and equities incline. Pessimism ensues when the correlation remains intact and equities decline. But while all correlations provide broad strokes of activity, they all either lose it simply get tighter at one point or another.In terms of currencies the reason we care, of course, can be linked into risk assumption or aversion.Broadly, since the beginning of this recession the dollar index has shared a negative correlation with world equity indices.As equities decline, the index goes up as investors run away from higher yielding currencies and assets to seek a safer route of investment.EUR, AUD, etc. 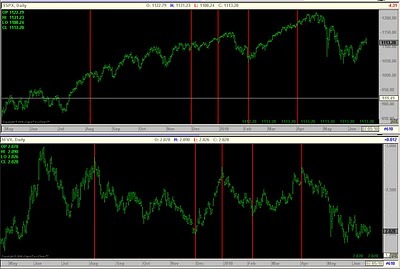 declined during 2008 for the most part, as a result of this peg.Conversely, as equities go up, the index declines as investors assume a greater degree of risk, as witnessed in very recent days. Chain linking one instrument to another, and to another, might seem like a unnecessary task, but like anything else awareness trumps all and simply having the knowledge of these types of relationships carry weight over the long run.But I stress that one shouldn’t get too ‘married’ to one particular relationship over another.Eventually, they all unravel to some degree, as individual inputs driving the prices of each instrument takes over and things eventually unwind.Regardless, I believe it’s worth noting, even if only in a broader sense.